The predecessor of the Palace Museum was the Forbidden City, the imperial palace that had housed 24 emperors during the Ming and Qing dynasties. Situated in the middle of the axial line of Beijing and built between 1406 and 1420. The Former Imperial Palace is a complex of 9,000 houses. Its architecture is unmatched anywhere in this world, and it is enshrined with a vast collection of precious cultural artifacts. It is the largest palatial complex in existence in this world today, and part of the world cultural heritage. The Imperial Garden in the Former Imperial Palace is typical of its kind. Situated north of the Hall of Earthly Tranquility, it is the backyard of the various palaces in the palace. Architectural structures. which constitute the main body of the entire garden. are arranged symmetrically in a hierarchical order. Rocks and trees are used as supplements to the buildings and the garden itself. The buildings are as a rule compactly laid out, and sumptuously built. From a regular and neat layout the architect sought to use a diversity of forms to play up the royal aura of the entire complex. The Imperial Garden is 130 metros long from east to west and 90 meters wide from north to south, and it occupies an area of 11,700 square meters, or 1.7 percent of the area of the entire of the Former Imperial Palace. The Gate of Earthly Tranquility provides access to the garden. All the buildings and scenes were arranged to cater to the needs of the emperor and his harem, masters of the Imperial Garden. 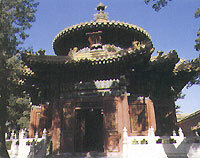 The centerpiece of the Imperial Garden is the Hall of Imperial Peace, which was dedicated to Xuan Wit, the Taoist God of Northern Lunar Mansions. The center of the hall is enclosed with a parapet designed to set off the awesome form of the hall. The marble balustrades around the hall are typical examples of Ming-dynasty sculpture. The hall is also flanked with pavilions and chambers. On either side of the Hall of Imperial Peace is the Hill of Accumulated Elegance, which was built of Tai Lake Rocks of varying shapes during the Wanli reign (1573-1620) of the Ming Dynasty. The center of the hill is scooped into a cave, and the stone to the left is inscribed with the two Chinese characters, "Cloud Root", in the handwriting of Emperor Qianlong. During the Double Ninth Festival (which falls on the ninth day of the ninth lunar month), the emperor would gather in the Pavilion of Imperial Prospects atop the hill to marvel at the autumn scenery. The pavilion also provides a general view of the Imperial Garden and the Forbidden City, inundated in a sea of golden roofs and vermilion walls. Behind the Hall of Imperial Peace is the Pavilion to Usher in Light, where imperial maids were chosen during the late Qing Dynasty. The Hall of Moral Cultivation situated to the west of the Hall of Imperial Peace was built during the Ming Dynasty and laid out on an outer shaped plan, which sits symmetrically with the inner-shaped House of Crimson Snow. The Hall of Moral Cultivation sits behind a screen of rocks, with corridors extending to all directions. The environment is graceful and picturesque. During the Qing Dynasty this was where emperors Jiaqing and Daoguan resided and read, and where the British tutor, Reginald Johnston, taught the last emperor of China Pu Yi English. The Pavilion of Ten Thousand Spring Seasons in the east of the garden also sits symmetrically with the Pavilion of One Thousand Autumns to the west. A footpath extends about one kilometer in the garden. It is paved with pebbles of multiple hues that are arranged in various patterns with themes drawn from the classic novel Three Kingdoms, theatrical figures, flowers and birds, and pavilions and halls. Apart from buildings of distinct characters, the Imperial Garden is also famed for its ancient trees - there are several hundred of them there. After many generations' careful cultivation, and tempered by the passage of time, these trees attract the visitor with a hundred and one exotic shapes; along with golden fish swimming in the ponds, they enable visitors to discover a world of horticulture behind the vermilion walls and under golden roofs.